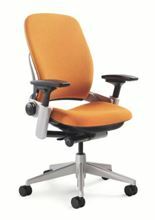 This is our in-house quick reference for the Steelcase Leap chair, and we want to share it with you. The set up link (see below), can be particularly useful for employees who are unfamiliar with this chair and need to set it up for the first time. Please refer to Manufacturer website for further information. 4D arms adjustable in height and arm caps slide in, slide fwd/back and pivot (option). This is a highly adjustable chair but limited cushioning on seat and back with plastic frame so some users do not find it comfortable enough. Good for smaller users as seat pan adjusts very short and chair goes slightly lower than some others. Fits a wide variety of people because seat pan is wide (although armrests adjust in) and 3” seat slider range. Available in a Plus model for larger users.